From the Renaissance to the 19th century, drapery played an active role in painting and sculpture. In the Romantic age, drapery went beyond a decorative role and became an element in itself, carrying the force of wind as well as heightening the action of the human character in the world. Drapery added force to a composition through color and movement indicating in a clear way the emotional tenor of a piece. 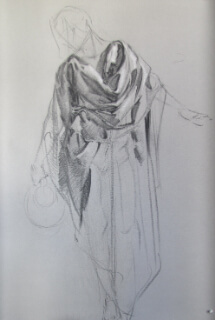 Many 19th century etudes, quick paint studies indicating in a brief way how the image would appear from a distance, clearly use drapery to carry the moral element of a piece. Today drapery has taken a secondary role again. In most cases simply being the clothing that one is wearing, the status it occupied prior to the Renaissance, or a minor element in a still life. My own work reflects more closely the Romantic attitude toward drapery. Drapery has so much expressive potential for a composition. In my own work, I allow the drapery, in many ways, to act as an independent character in the composition. It takes on dramatic forms to express action and color, but also to be a force to be reckoned with. In some cases it provides the counterpoint of the larger movement – pulling away or against the figure. It can also act as an element that allows the figure to rise upward out of its ordinary dimension calling for a an implied vertical ascent. It can also heighten the internal movement of the figure, implying its next action and increasing the emotional effect of that action. In a sense, it can give the viewer a feeling for what will happen in the next scene as in a play. Besides movement, the color of a drapery can act as a key or chord as in music, giving one unconsciously, an immediate feeling for a piece. Just as in music, one only need hear the first part of a piece to gather its tenor and emotional bent, so with color, specifically drapery, to give an immediate sense of where the piece is going. I like to think of my work as related to music and dance. I began my artistic pursuits as a theatrical lighting and scene designer and loved especially to work with dancers- to produce an entire effect with a minimal amount of outside elements. I found this method particularly beautiful. I have retained in my work this sense of minimalism combined with the fullness of the emotional element in the compositions. Color gives that sense of lushness and drapery carries this fully adding significantly to the movement of a piece. Action, color, movement and expressing what can only be implied are just some of the ways drapery can activate one’s compositions. I will be teaching a workshop at the Woodstock School of Art on the weekend of May 7 and 8. 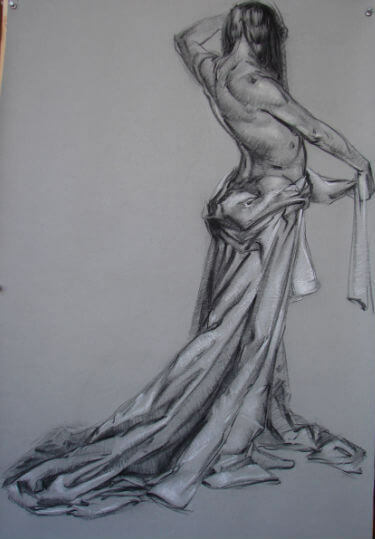 And I will cover how to render different types of drapery as well as to compose drapery on the live model. I will discuss building a figure that will act as an armature on which to design the drape. 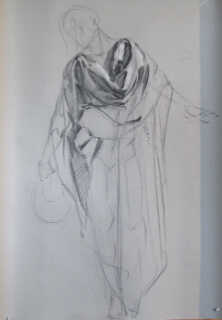 We will look for lines in the drape that reflect the movement and rhythms of the figure. We will observe repeating patterns, points of gravity and characteristic differences in various drapes. We will then model the drape, elaborating as we progress but also simplifying in order to maintain the over- all effect we are after. On day 1, I will discuss the general characteristics of various types of drapery as well as the characteristics of various folds and their origins. 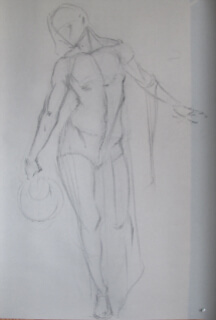 There will be a demonstration covering the basic construction of the figure and designing the drape. Then the class will be able to draw from various set-ups provided. Day 2, we will work from the live model in two sessions. Session1, we will construct an armature that implies the action and the rhythm and the proper proportion of the figure. Session 2, we will work with the drape and the life model, being ever attentive to the over-all design and elaborating upon that design through the modeling of the drape. Since there is much to cover, this class will strictly be a drawing class. Last year, the workshop was very successful and I have great hopes for this up-coming session. Looks like it`s going to be a strong workshop. 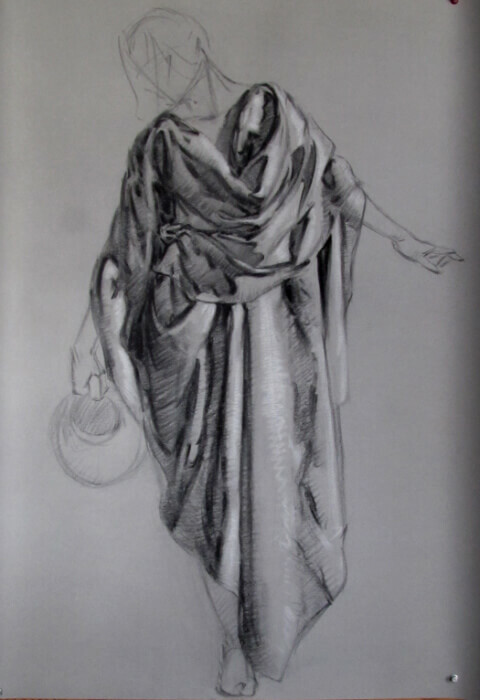 I took it with you last year and it was a very focused and valuable study of drapery and the figure. It was enlightening and enjoyable I will highly recommend it to my students.